Margot, who lives in a comfortable middle class apartment, fears that she is losing her mind after having had her second child. Her husband Kurt, who is busy studying for an exam, does not understand her situation. Her mother-in-law and sister-in-law Lore are openly hostile to her. She resorts to valium and drink, and looks for sympathy, but to no avail. The hausfrau’s borderline horror before a three-panel mirror: “So this is me. Me. Me? What is that? What is that, me?” Rainer Werner Fassbinder’s title not accidentally echoes one of Rainer Maria Rilke’s poems (Fear of the Inexplicable), and indeed the heroine (Margit Carstensen) experiences the spiral of “relationships repeating themselves from case to case, indescribably monotonous and unrenewed.” Having just given birth to her second child, she finds herself sinking into a mysterious, debilitating, ruthlessly muted panic, which Fassbinder visualizes with throwaway wavy filters that are perfect in their banality. Her husband (Ulrich Faulhaber) is a loving but passionless man, her young daughter (Constanze Haas) can’t understand the growing hysteria; the word “normal” is tossed around judgmentally, most of all by her mother-in-law (Brigitte Mira) and sister-in-law (Irm Hermann), who skulk downstairs. 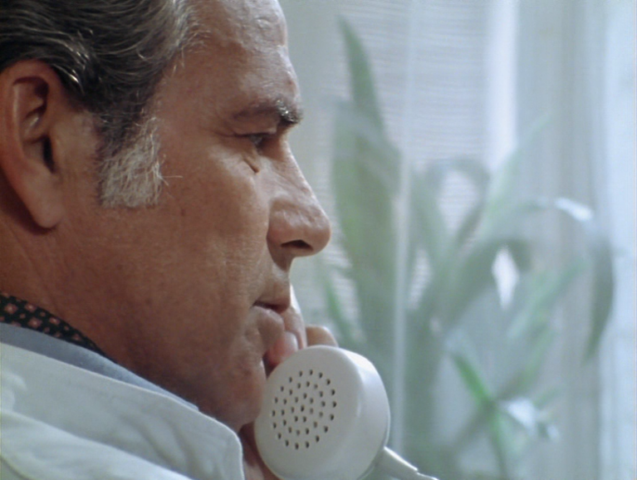 Feeling the void, Carstensen desperately tries to fill it: Frantic swimming sessions, Valium, cognac bottles, Leonard Cohen, a fling with a handsome, graying pharmacist (Adrian Hoven). When she spills her medication in a bathtub, the image of blue pills against white porcelain suddenly becomes a snapshot of a tangled inner cosmos — the housewife contemplates it for a moment before running a razor across her wrist. The Vertigo dolly-zoom effect unsettles the opening domestic tableau of a family together, yet the film manages to be both more clinical and more humane than Martha: “I wanted to take my mind off the fear,” the neurasthenic heroine muses on her way back from the clinic while the husband stares ahead, teary-eyed. Carstensen is put through the revolving door of institutions, one place diagnoses schizophrenia, another settles for deep depression. 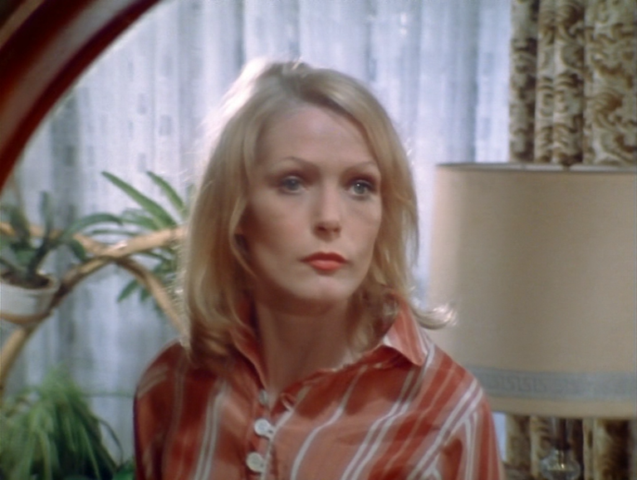 Only two people really see her, Fassbinder through a tightly framed second-story window, and Kurt Raab as the “sick in the head” neighbor, lost in his own abyss. The man goes the way of Why Does Herr R. Run Amok?, the housewife, now “comfortably numb,” labors not to care. With Armin Meier, Ingrid Craven, and Lilo Pempeit. 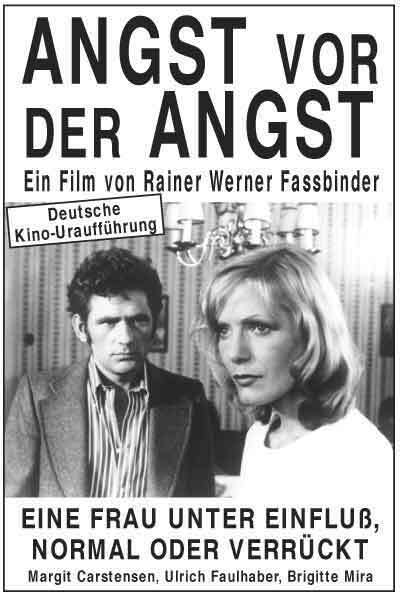 Rainer Werner Fassbinder directed Fear of Fear for German television some two years after the similarly themed but superior nightmare comedy Martha. Both films feature housewives being driven to insanity by their largely oppressive environments though Fear or Fear counts as the more humanist exercise. If not entirely successful, the film still puts the preening melodrama of The Hours to shame. Margot (Margit Carstensen) finds herself succumbing to a seemingly inexplicable hysteria just weeks before she’s about to give birth to her second child. Easily agitated by her husband Kurt’s dismissals and her daughter Bibi’s whims, Margot loses herself to a crippling fear of fear, which Fassbinder repeatedly and tiresomely suggests by wavering the woman’s sightline. Margot begins to sleep with a local doctor in exchange for bottles of Valium, all the while dodging the bloodshot eyes of a snickering drug addict that she may or may not have shared a past with. Margot’s mother and sister are monsters, seeing fault in her need to cuddle and kiss her children. 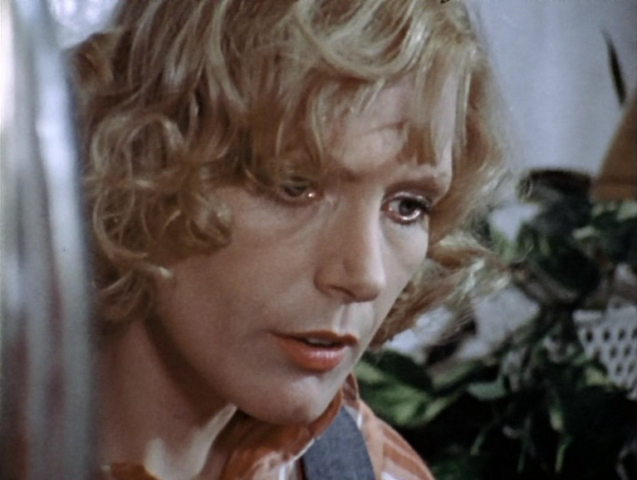 If Fassbinder fails to provide a proper context for Margot’s bourgeoning insanity during the film’s first half, he later evokes a lecherous society’s desire to squeeze the life out of the woman during her moment of weakness. 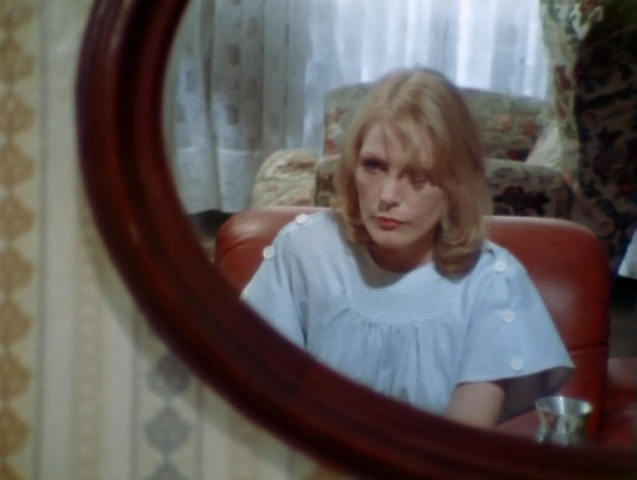 Whenever Margot steps out of her apartment, Fassbinder repeatedly shoots Carstensen in such a way that brings to mind an irreparably damaged and writhing organism patronized beneath the lens of a microscope. Margot’s decision to drown herself in liquor, drugs, and music (notice the metaphoric use of Leonard Cohen’s “Lover Lover Lover”) is her seductive way out of a banal and carnivorous modern world.